Philadelphia-based photographer Quil Lemon hopes his photography will help transform people’s minds. 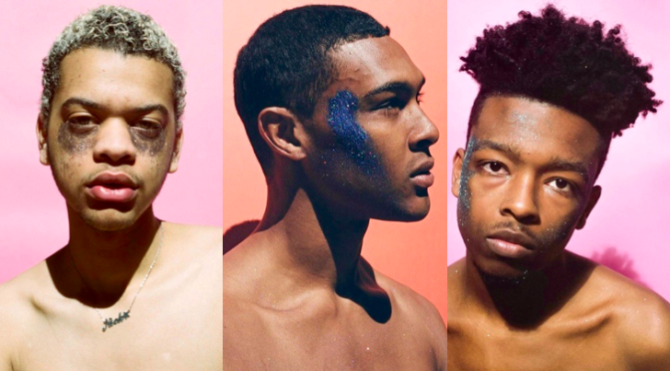 The idea is pretty simple: Young black men pose wearing glitter in an effort to challenge traditionally-held beliefs about masculinity, gender, race, and sexuality. Okay… I’m sorry, but this is not challenging black masculinity in the slightest. It’s cute and all, but it’s just cute, not awe-inspiring or riveting or even thought provoking. The standard for “art” is being set seriously low. I totally agree. A bit boring. If the theme was glitter, then he should have been much more creative with the glitter other than painting a small patch of glitter on the sides of the model’s faces. Ouch. Xzamilloh, my dear, we get the point. You didnt like it. lol lol But from you that was a bit vicious. I think (or at least I am going to) that what probably happened was the guy sent over too many pics and it was hard for the author to choose from so he pieced together those. The third one down is cute but the lighting and color it totally…………….to make a long story short, you said it right. I’m sorry if that came off as vicious, but it can be a tad disappointing to see something hyped up to be more than it is. If you want to challenge black masculinity, someone like The Game or Mahershala Ali could come out in some leggings, a mesh tank top and face beat to the gawds while still emoting the same swag and finesse that they usually have. People wouldn’t know what to do with that. The artist is still a student. Cut him some slack. He’ll develop his ideas if he’s given enough time and resources. Seeing the portraits of black and brown queer men is refreshing. Nothing to do with black masculinity or challenging it. A bunch of mixed breed sissified girly-boys will simply be laughed at by real black males. Where are you going to find any “real black” as opposed to “mixed breed” males? Certainly not in America. Actually you can find real black males in America and plenty who have the real black look. The pictures here are revoltingly mixed. I love the concept behind the idea, and I’ve seen other black photographers challenge the same topic with their work – and have done it a little more effectively. But, he’s still young and he’s at least giving a lot of thought into the type of work he wants to produce. It’s a great outlet for understanding your place in the black community as a gay man who’s so young while also challenging the minds of others. Kudos to him!